In blocking a Tory coup, May has managed to sidestep her party's brutal family feud, the same one that started the U.K. down the bumpy Brexit road in the first place. But getting through that challenge was only one obstacle on a road still crowded with obstacles. 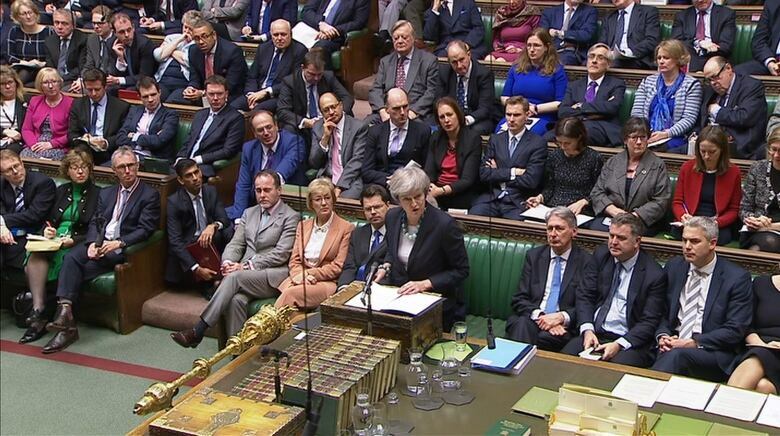 It may seem like a triumph for British Prime Minister Theresa May, but even after winning a confidence vote Wednesday, she is not yet in the clear. The Tory euroskeptic insurgency — at 117 strong out of 317 MPs, by Wednesday's count — lives on. "That is a huge vote against her," Conservative MP Jacob Rees-Mogg, a vocal Brexiteer and one of the first to submit a letter demanding a confidence vote, told the BBC shortly after the vote. "It is a serious blow to her authority," he added. "The urgency of a new leader is not reduced by today, it's increased." Still, surviving the confidence vote — with 200 MPs voting in favour — is for May one more milestone in an improbable survival streak that has defied all predictions. With the same stiff, steely manner in which she first declared "Brexit means Brexit" back in 2016, May stood before Downing Street Wednesday morning to stare her challengers down. "I will contest that vote with everything I have got," she said. At night, she returned to the same podium, promising to bring about a Brexit that "brings the country back together rather than entrenching division." In between those two appearances, her office was reportedly offering incentives to hesitant Tories by hinting she would step down before a general election. She also made that promise before the Tory 1922 Committee that conducted the ballot. Critics say the necessity of that promise alone shows the weakness of her support. Yet in the Commons Wednesday, May seemed energized in the face of attack — raising the spectre of a Labour government and a delayed Brexit if she were to go. The biggest threat to the UK is "not leaving the EU, it's a [Jeremy] Corbyn government," she growled, referring to the Labour Party leader. 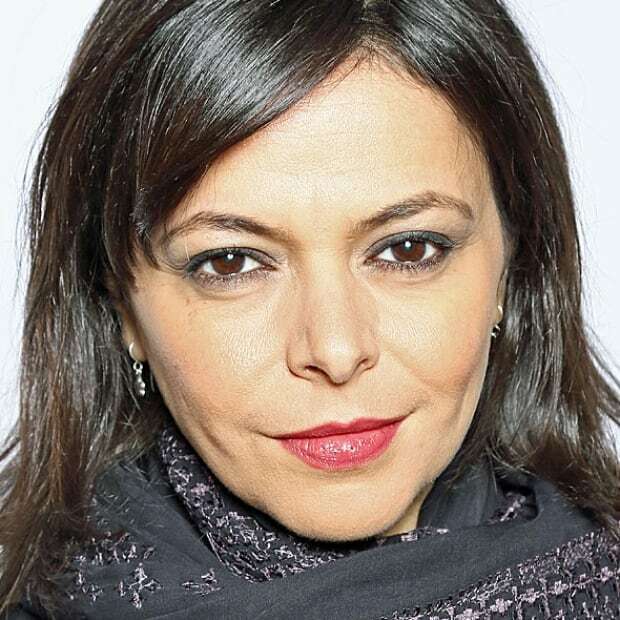 Unsurprisingly, the confidence vote drew howls of complaint and derision from all political corners in the Commons, including a former Tory minister who stood up to call it "unhelpful, irrelevant and irresponsible" as the country faced a "grave national crisis." The insurgents clearly didn't think so. And after weeks of trying, they had submitted the requisite number of letters — 48 — by last night to officially mount an attempted coup. It was clear from the start that by stepping up to lead a disunited kingdom, Theresa May was taking on a treacherous job. Improbably, she has thus far survived, even through a disastrous election and awkward negotiations with the EU, and even though the Tory ranks are rife with contenders who have been jockeying for months, some even for years, for that job. And now she has survived an overt attempt to oust her. Though they failed, they will still "attempt to use this result to get more concessions" on how to deliver Brexit, says Joe Twyman of U.K. polling firm Deltapoll. While the non-confidence vote was a distraction, and the victory tarnished, a weakened and wounded May can get back to Brexit business — and its perils. So as the political drama gripping this country shifts away from one cliff's edge, it is making its way straight toward another. May is safe from another Conservative non-confidence vote. But still to come could be several even more consequential votes in Parliament that promise their own drama and present threats to May's leadership. 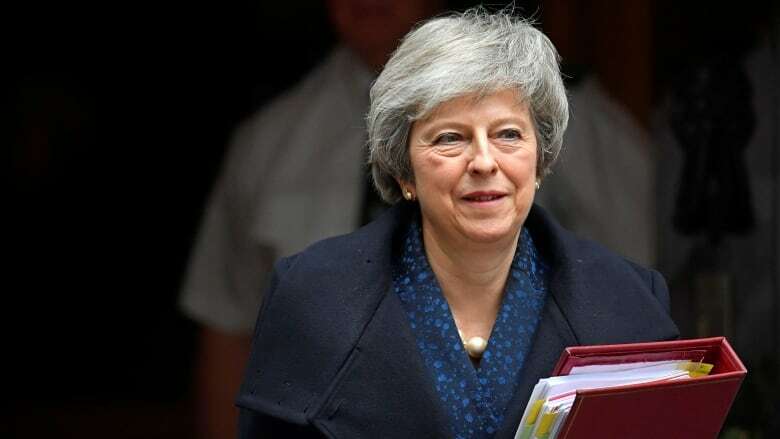 She still has to persuade the many skeptics on all sides of the Commons, including her party, that whatever she brings back from Europe after a new round of talks is what they should adopt as the Brexit blueprint. First, she will head back to Brussels Thursday to clear up the most contentious part of the deal: a provision that guarantees an open border between the Republic of Ireland and Northern Ireland. If the assurances from Brussels aren't enough for skeptics, then it's back to the ambiguity that prevailed before May delayed the "meaningful vote" on the deal that was supposed to take place earlier this week. The deal, then, could still be defeated in the Commons — with the help of that Tory insurgency that made its strength known today. If the result of Wednesday's vote has not emboldened her critics, it also did not dampen them, said Twyman. "It may well be that when the vote [on the deal] arrives in the House of Commons … she may find it increasingly difficult to bring those people onside." 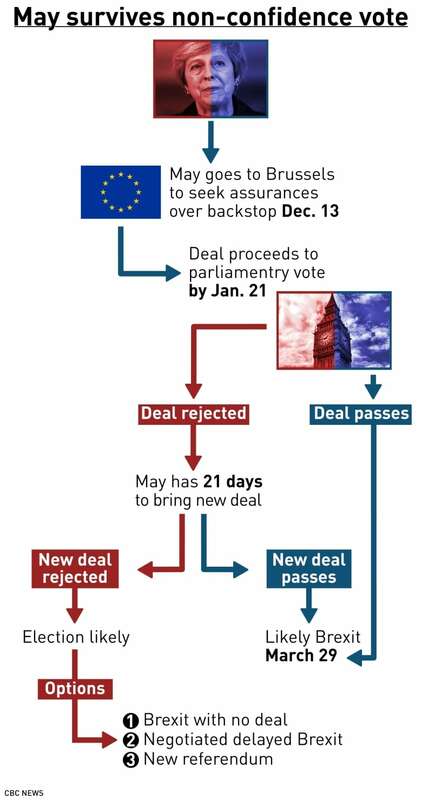 That might explain why May continues to be coy about the exact date for bringing the deal back to Parliament for a promised vote. There could also be a different treacherous vote: a non-confidence motion in the government, which the Labour Party has said it will bring forward when the time is right. Either of those votes might ultimately bring down May and her government and spark elections. With just weeks left before embarking on one of the most significant changes in generations, the U.K. stands in disarray. But it's become a familiar posture.